This morning literally marks the road to a New Beginning as Shinsuke Nakamura is set to make his final appearance in New Japan Pro Wrestling. 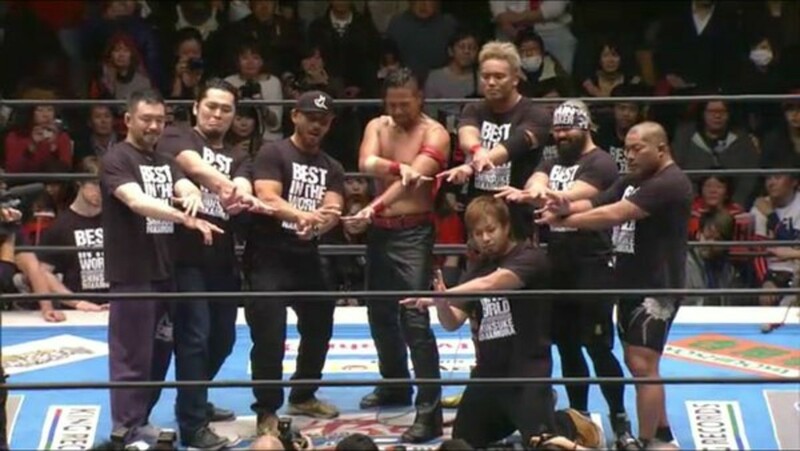 Nakamura’s career has always gone in different paths than normal wrestlers who made their way through the New Japan system. He won the IWGP championship within his first year of wrestling, which is something that almost never happens, be it New Japan or anywhere else in the world. He was alright in his role as a main eventer, but came across as bland and uninteresting, perhaps due to the fact he was put in the spotlight very quickly and wasn’t able to find himself. It wasn’t until his return from an excursion in Mexico where he became known for his charismatic style that made him into a bona fide star in New Japan, not just a guy headlining cards. But now he’s leaving the promotion that made him to test new waters - the WWE. Personally, I think he’ll do fine as you need to be charismatic in the WWE to truly succeed, and Nakamura has that down pat. It’s also up to creative and luck of the draw. But at least here, tonight, we’ll be able to see him one last time as a true headliner and top star of one of the biggest promotions in the world. They’re treating this as a bigger deal than most “Road To” shows as there is commentary and a multiple camera setup tonight. Finlay’s titantron respectfully gives his birth year and stats. That’s kinda plain...then again, I guess that’s the goal of a young lion. Kawato seems very tiny, even by young lion standards. Finlay, who is also a junior heavyweight, dwarfed him. He’s the eighteen year old straight out of the dojo. He looked fine, a bit green but that’s expected in his second match ever. Finlay looked great. Its these kind of matches that make you feel like you’re seeing great results from the New Japan young lion system as you see noticeable improvements a year in. Finlay submitted him with a Boston crab. It’s so rare to see a Yoshi-Hashi singles match...I think I can count on one hand how many televised singles matches he’s had in the last year! White also looked very good here. If it wasn’t for Chad Gable being a bit more colorful I think he would have gotten more votes for rookie of the year. People were into him and he got a few near close calls, including a crossface. YH eventually powerbombed him then bridged him for the win. I wonder if Liger and Tiger Mask are still feuding over the NWA Junior Heavyweight title. They kept pushing Nakanishi out of the ring as they worked over Tiger Mask and Nagata. He finally got a tag and Nakanishi looked slightly more mobile than usual in making a comeback, which isn’t saying a lot. He ran roughshod on everyone. Tencozy made their comeback with the 3D and Kojima pinned Nakanishi with a lariat. Solid bout given the participants. This seems to be a continuation of a feud that’s been going on lately between Yano and Bad Luck Fale, but now it’s also over Yano’s six man tag titles. Not much of a match, just some back and forth with added Yano antics. He did his taunt as Fale was going to the grenade but Yano caught him. Yano tried to use the ref as a distraction, but not only did it not work, Takahashi low blowed him. Fale followed that with the grenade and pinned Yano. They showed the press conference where Nakamura relinquished the Intercontinental title during intermission. This tour, Taguchi decided he’s going to dress like Dr. Doom: green cape, mask, everything. As usual, Taguchi & Kushida did most of the work and didn’t seem interested in tagging in CNJ. I don’t blame them since he takes the pin in literally every match he’s ever been in. Regardless, I guess because he hasn’t been around most of this month Korakuen Hall were into his comeback. Kushida tried to do a run in but Bushi sprayed him and did a suicide dive. The rest of Los Ingobernables left Taguchi lying with their finish, then Evil laid out CNJ with the STO for the win. The finish was hot, everything else was just okay. After the match, Bushi cut a promo saying he hopes he’s looking forward to his last title defense. Typical multi man NJPW tag match with all the usual tropes. Doesn’t mean it’s bad, actually the last few minutes were pretty great. Elgin powerbombed Anderson into the rest of the Bullet Club. Omega came back in and hit a reverse rana, which was pretty damn amazing. He hit a running knee to the corner, taking out Robinson, then pinned him with a knee strike very similar to the boma ye, I guess to mock Nakamura. Another solid match. They aired a fantastic video highlighting all the big moments of Nakamura’s career, from his debut match to winning the IWGP championship for the first time in 2003, the arrival of Chaos, winning the G1 Climax in 2011, winning the Intercontinental championship for the first time, and much more. Korakuen became lit when Nakamura’s music hit. Signs were everywhere. They teased Nakamura and Tanahashi squaring off but Goto came in instead and he and Okada started. He’s been acting way more heelish since the title callout earlier this month, but that’s probably just through the title match. Mostly a straightforward match where everyone worked each other’s rivals. Fans were into whenever Nakamura did his trademark spots. Nakamura has Tanahashi down at one point and motioned for the boma ye but Shibata and Goto laid him out. Tanahashi went for the high fly flow but got the knees up. Nakamura went for the boma ye, but Tanahashi countered with the slingblade. Shibata and Ishii closed out the match. After a good back and forth sequence, Ishii pinned him with a brainbuster. Just a tag match, but a good one. Omega hit the ring. He said that Nakamura calls this a graduation, but he’s just scared of facing him. Tanahashi then appears. After saying a few lines, he makes it clear that he is X, and will face him at New Beginning. Omega leaves, unamused. Nakamura takes the mic and says he won’t say goodbye, but thanks everyone. The rest of Chaos come out to celebrate with him as they posed for pictures. Both Okada and Nakamura were emotional as Okada put Nakamura on his shoulders and they left the arena. Very memorable show for the ending and main event, obviously. Usual solid action up and down the card.